Editorial Offices: 3400 Sumner Blvd. 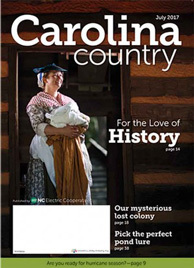 Carolina Country is a consumer-oriented monthly magazine that North Carolina’s Touchstone Energy cooperatives send to more than 710,000 families, giving it more Tar Heel readers than any other North Carolina-based publication. The magazine also goes to nearly 2,300 nonmember subscribers, plus libraries, schools, newspaper editors and other opinion leaders.